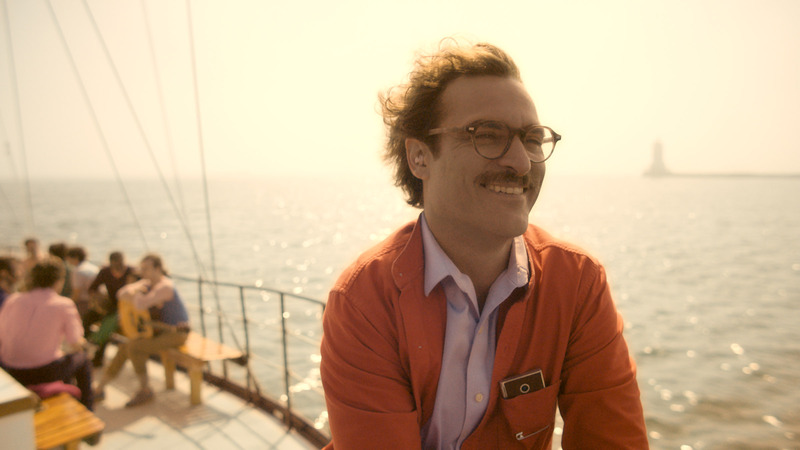 « Her », mysterious title, mysterious poster with only Joaquin Phoenix’s head, everything to catch my curiosity. Produce by Spike Jonze (the one who know this guy before this movie can raise one hand :D) and release in 2013, this movie get a grad really high on Rotten Tomatoes (8.5/10) and it is the same on almost every websites. So let’s see the trailer to have a first taste of this movie. The story take place in a close future. Theodore Twombly (Joaquin Phoenix) is a solitary and introverted man working for an agency which write personnel words and letters for you family, friends and love, just like it was you holding the pen. Despite his amazing skills to draw with perfection strong feelings for others on paper, he is not capable to do the same for himself, for his life, so his life is sad, without love and only fool of regrets and melancholy. Moreover, due to the divorce demand coming from his child love Catherine (Rooney Mara), Theodore finally let him convince by buying an OS, an operating system, like an A.I. which is really trendy. It is elaborated to adapt and evolved itself according the owner, so in this way you can have someone to talk, breaking the loneliness, someone that can understand you perfectly. He decide that this OS will be a women and she names it(her)self as Samantha (Scarlett Johansson). Theodore is fascinated by Samantha’s skills to adapt and evolved along their endless discussions, in order to be in phase with him. They become more and closer. Samantha became the prefect incarnation of everything he was searching for in a partner, available, paying attention about what he say, about him, always available, curious, interested, sharring same tastes and desires. He will fall in love of her, and thanks to her He will evolved, learn to let go and move one about the past of his life and live back looking strait forward, looking at the future. For me this movie is a magnificent beauty UFO. I heard a lot about this movie, only good things, but without any special details about the deep story of the movie. Now, after seeing it, I understand better why it was quite difficult to explain in details this movie. First of all, the poster can be a little bit confusion because you see only the face of Joaquin, it is quite minimalist but you don’t have to be scary 😉 Because this movie really worth the shot. The cast is not too big so in this way you have only good actor with of course Joaquin Phoenix, Scarlett Johanson, Rooney Mara but also Amy Adams, Olivia Wilde and Chris Pratt. This movie speak about human relations. There is no action at all, no violence, nothing that you can find generally in a blockbuster, and it is really pleasant (I did not say that I do not like those movies, it is just it’s great when you have different types of movies, and with this one it change your movies habits). We are following the main character with attention, everything is calm, without a lot of music, and you just have to focus on the speech and the feeling of the Theodore. I have to admit that the rhythm is slow, but everything move sufficiently rapidly to not be bored. We discovered step by step the past of the character, his personals problems and the event that push him to buy this OS. The producer depict a believable world that could be our close future, sterilized, where human relations would be only behind a screen, cold and impersonal. 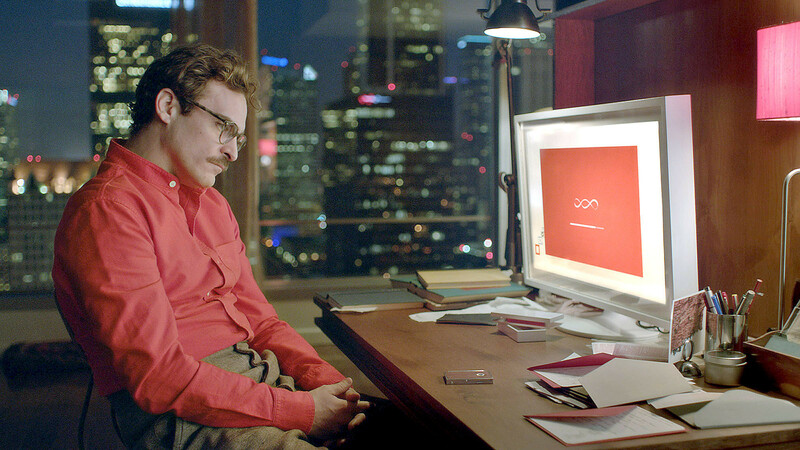 Jonze managed to draw a poetic cyber-romance between Theodore and Samantha. OS are showed like a solution, an alternative to the human loneliness where they locked them up by themselves. Joaquin Phoenix and Scarlett Johansson are almost the only characters on the screen (more or less for Scarlett :p) and they carrying the all movie by themselves. Phoenix is astonishing during all the movie, with a highly sensitive interpretation. He fined his soul mate with Samantha, someone that can listen, laugh, share and take care of him. It is cute, adorable and touching. We are the witnesses of the love bounding Theodore and Samantha, and also the emancipation of Samantha. It is a 22nd century love story touching and we cannot resist. To conclude about the movie “Her”, I think it is a kind of movie that you like or dislike without intermediate point of view, because it is a non-conventional movie compare to all the actual productions. But if you like love stories, and great actor performance, I can assure you that you will like this movie! There is a philosophical dimension (with poetry) because Jonze push us to think about the actual relation between people in the society, the people we love, the people that we encounter during our life, and sometimes it is better to be honest with ourselves in order to move one and not being stuck in the past. 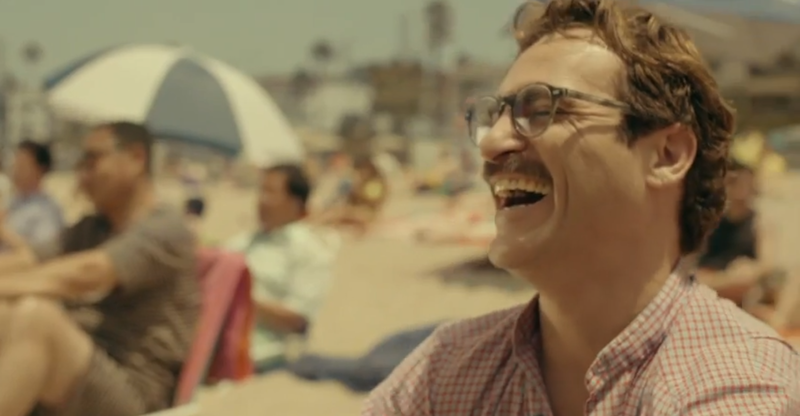 « Her » deserve a big 18/20, this is a beautiful movie that you have to see! Cette entrée a été publiée dans Articles Anglais, English post, Movies reviews et taguée 2013, 22éme siècle, 22nd century, AI, amour, Amy Adams, art film, Artificial Intelligence, auteur, author, cinéma, desmond andrew green, feelings, film, film d’auteur, Her, IA, Intelligence artificielle, Joaquin Phoenix, love, minimalist, minimaliste, movie review, Olivia Wilde and Chris Pratt, Ovni, philosophical, Philosophie, philosophique, philosophy, Relation, relationship, revue cinéma, Rooney Mara, Samantha, Scarlett Johansson, sentiments, Spike Jonze, UFO.